When Words of Radiance first came out, it was famously quite big. The manuscript was large enough to sink a yacht, the word count would've made Robert Jordan blush, and the final published version of 1088 pages was the largest-possible book Tor could ever have bound at the time. When I wrote my review of The Way of Kings, I said that although a doorstopper could be intimidating because of its sheer length, The Stormlight Archive was one of the rare examples of a series which needed all of its space to get the job done right. Oathbringer, the third book, clocks in at 1243 pages for the UK/Australia edition, more than any other Brandon Sanderson book. It's the longest novel I've ever read. Some folk said it seemed an untenable length. Well, initially I might’ve agreed with them. Picking up right after the end of Words of Radiance, the Alethi have taken control of Urithiru, ancient city and font of knowledge for Roshar’s past. As Kaladin races to save his hometown of Hearthstone from the encroaching Everstorm, and Shallan works to uncover the mysteries of Urithiru, Dalinar forges ahead with his plan to unite the disparate nations of Roshar to challenge the unstoppable force of the Voidbringers. All the while, with the Knights Radiant refounded by Dalinar, more folk across the world are starting to manifest Stormlight powers. 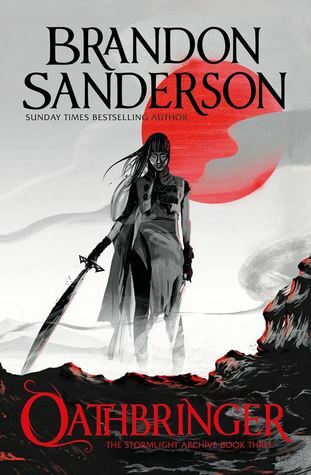 As always, Sanderson’s command of plot is indisputable; the man knows how to write a roaring story with the requisite status quo upsets and unexpected narrative flourishes. Oathbringer deepens our understanding of Roshar’s past, which informs major consequences felt by the cast in the present. Concurrently, Dalinar’s mission to create rather than conquer brings solid political focus to the narrative, never getting dull or overly meticulous in its description of Alethi diplomacy and Roshar governance. Rarely have political conference scenes in a fantasy novel been so compelling. 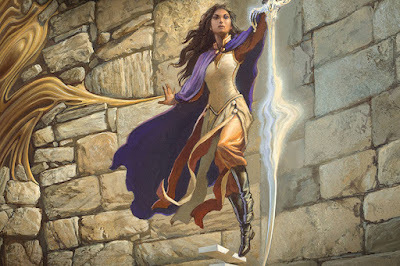 The myth arc of The Stormlight Archive is sustained well by its connection to smaller, more personal arcs. As much as the Voidbringers and their godlike leader are a pressing threat to the world, other conflicts occasionally take center stage; one character struggles with an unhealthy substance addiction, while another has a severe identity crisis which manifests in a way that only epic fantasy can suitably manage. Every nation Dalinar tries to unify has its own issues going on, hampering the way forward for a potential alliance and deepening the already superlative worldbuilding. All the small things, overshadowed as they are by the imminence of the Voidbringers’ assault, keep us compelled. Flashbacks also take a hard left turn this time around, with Dalinar as the focus character. The difference between his past and present selves couldn’t be starker; though Kaladin and Shallan were different people in the few years before Kings and Words, respectively, the younger Dalinar - far from being a diplomatic shepherd of mankind - is a bloodthirsty brute who longs for combat. His journey from there to here may be the best use of the flashback chapters thus far, outlining a painful odyssey to become a better man that goes to some very unexpected places. Speaking of the journey, as mentioned above, Oathbringer is a massive book even by doorstopper standards. There’s a rush of plot at the start as we catch up to everything our heroes have done in the ten minutes since Words ended, and there’s the expected Sanderson avalanche at the end when everything hurries to the climax. Between these points is a story preoccupied with what I’d call “fantasy slice-of-life”. While there are still plot-centric things happening, a vast chunk of the book focuses on more mundane things by comparison; soldier training, minor political movements, even a little bit of farming and resource management. Though it never crosses into the dry territory that the middle of The Wheel of Time occupied, there are points where the book’s immense length can feel like an overindulgence rather than a necessity. But then, everything snaps together at the end. It’s a common thing to say for a lot of novels, and seems a bit obvious, but it’s true. The final stretch of Oathbringer brings all the chickens home to roost, and gives greater clarity to both the engrossing, epic storylines and the few odd, discordant or banal subplots coursing throughout the book. Much like Stormlight’s ketek poetry format, Oathbringer reads like a palindrome, where everything is matched, paralleled or book-ended. (which makes sense, given the names of all 5 parts in the book themselves combine to form a ketek.) If you’d asked me during the book whether the length was an issue, I’d’ve had some quibbles, but by the end, I’d say the length is justified. In large part, that’s because of the characters we spend our time with. To say the cast continues to be well-rounded is an understatement. Sanderson has written this series from a deeply human place, even when it comes to more otherworldly characters like the Parshendi or the myriad deities that Stormlight and the greater Cosmere saga deal with. As epic and fantastical as the series is, its cast is coloured by such realistic nuance. Their battle for the future of Roshar against godlike forces is textured by real world struggles: relationships, mental illness, substance abuse, self-doubt and troubled pasts. A benefit afforded by Oathbringer's enlarged pagecount is the capacity to explore these issues in detail. So much of the book is spent fleshing these folks out with their day-to-day dramas in amongst all the world-shattering revelations and mighty battle scenes. One character internally describes their mood in a way that increasingly seems like clinical depression; another grapples with romantic problems in a way many of us, human or Parshendi, would find relatable. As thrilling as Oathbringer’s overarching plot is, its characters offer the book’s highest merit. While I wouldn’t call it a perfect book - some sections in the midpoint lag a little, and a couple of twists are telegraphed fairly blatantly - I'm still giving Oathbringer a full score. I'm not sure if it beats Words of Radiance as my favourite Sanderson book (a reread will probably help settle that question), but if it doesn’t, it’s by a margin so thin as to almost be nonexistent. I can safely say the book is a worthy successor to Stormlight's superlative sequel, both an important instalment in the grand Cosmere saga and a fantastic story in its own right. But in addition, Oathbringer has solidified to me why I love this series so much: the people who populate it. This is a world that is so expansive, mystifying and awe-inspiring, but it would be lesser without featuring such enjoyable, nuanced characters who experience triumph and defeat together; folk who I would gladly spend more time with. In large part, The Stormlight Archive succeeds because its heroes and villains are richly defined and consistently compelling. Sanderson best said it himself back in 2010 when he first introduced The Way of Kings: "a great book for me isn't about the magic, it's about the people that the magic affects." By keeping its characters front and centre and giving them the time they deserve, Oathbringer proves that greatness with ease. Oathbringer is available in Australian bookstores on November 14th. Review copy kindly supplied to Geek of Oz by Hachette Australia.